St. Mark the Ascetic: Let all involuntary suffering teach you to . . .
Let all involuntary suffering teach you to remember God, and you will not lack occasion for repentance. This entry was posted in Sayings from Saints, Elders, and Fathers, St. Mark the Ascetic (St. Mark the Monk) and tagged Quotes from the Philokalia, Remembering God, Repentance, Short Quotes, Suffering on August 20, 2015 by . St. Mark the Ascetic: God tested Abraham. . . .
God ‘tested Abraham’ (cf. Gen. 22:1-14), that is, God afflicted him for his own benefit, not in order to learn what kind of man Abraham was – for He knew him, since He knows all things before they come into existence – but in order to provide him with opportunities for showing perfect faith. 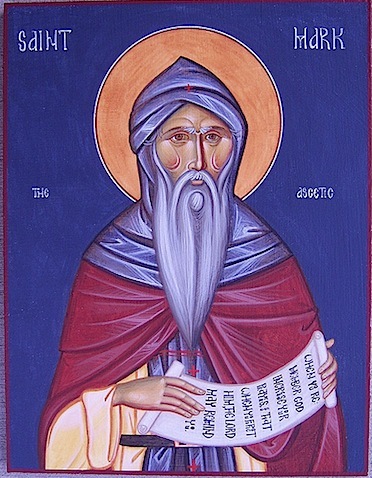 This entry was posted in Sayings from Saints, Elders, and Fathers, St. Mark the Ascetic (St. Mark the Monk) and tagged Afflictions, Faith, Faith in God, Old Testament Events, Old Testament People, Omniscience of God, Patriarch Abraham, Quotes from the Philokalia, Sacrifice of Isaac, Short Quotes on September 13, 2014 by . St. Mark the Ascetic: When you suffer some dishonor from men . . . This entry was posted in Sayings from Saints, Elders, and Fathers, St. Mark the Ascetic (St. Mark the Monk) and tagged Dishonor, Gift from God, Honor, Innocense, Quotes from the Philokalia, Short Quotes, Sorrow, Steadfastness, Suffering on June 27, 2014 by . St. Mark the Ascetic: He who hates the passions gets rid of their causes. . . . This entry was posted in Sayings from Saints, Elders, and Fathers, St. Mark the Ascetic (St. Mark the Monk) and tagged Overcoming Sin/Passions, Passions, Quotes from the Philokalia, Short Quotes on February 14, 2014 by . St. Mark the Ascetic: He who is ignorant of the enemy’s ambush . . . This entry was posted in St. Mark the Ascetic (St. Mark the Monk) and tagged Enemies, Passions, Quotes from the Philokalia, Short Quotes, Spiritual Warfare on January 29, 2014 by . St. Mark the Ascetic: The forgiveness of insults is a sign . . . This entry was posted in Sayings from Saints, Elders, and Fathers, St. Mark the Ascetic (St. Mark the Monk) and tagged Divine Love, Forgiveness of Others, Quotes from the Philokalia, Short Quotes on January 22, 2014 by . St. Mark the Ascetic: Whoever prays for those who hurt him . . . This entry was posted in Sayings from Saints, Elders, and Fathers, St. Mark the Ascetic (St. Mark the Monk) and tagged Conquering Evil, Demons, Enemies, Love, Loving Enemies, Prayer on January 20, 2014 by . 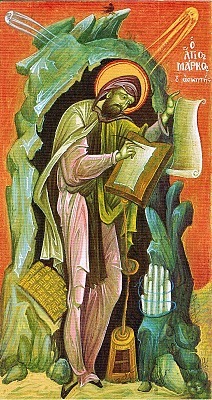 St. Mark the Ascetic: We must receive the one who curses us as a messenger from God . . . This entry was posted in Sayings from Saints, Elders, and Fathers, St. Mark the Ascetic (St. Mark the Monk) and tagged Correction, Enemies, Evil, Loving Enemies, Overcoming Sin/Passions, Passions, Rebuke, Secret, Thoughts on January 19, 2014 by . St. Mark the Ascetic: When you have been insulted, cursed, or persecuted by someone . . . This entry was posted in Sayings from Saints, Elders, and Fathers, St. Mark the Ascetic (St. Mark the Monk) and tagged Blessings, Curses, Enemies, Insult, Loving Enemies, Persecution on January 18, 2014 by .